If you want that perfect cup of coffee at that perfect temperature, the Bunn BT Velocity Brew 10-Cup Thermal Carafe Home Coffee Brewer will deliver these results. This coffee maker is unique in that it uses an internal water heater to keep the water warm and ready to brew. When you want to make a cup of coffee, all you have to do is pour in the grinds and a full pot of coffee will be ready three minutes later. The results are great and the machine is efficient, making it perfect for families or those that love to entertain. What’s So Great About the BUNN BT Velocity Brew 10-Cup Thermal Carafe Home Coffee Brewer? Fast: Why wait for your morning coffee to brew when you can have it in three minutes? With the Bunn BT Velocity, you can have a full pot of coffee in this short timeframe, plus have hot water available for tea and hot chocolate. With an 800-watt heater, the water stays at an ideal temperature so that brewing is super fast and the end product is delicious. With this smart design, you can entertain with no problem, or just make a hot pot of coffee for yourself with no wait time. Basic: With this Bunn coffee brewer, you won’t be overburdened with unnecessary programmable features. Just the necessities are there, and since the coffee brews so quickly, you don’t need to mess with pause-and-serve features. When not having timers and clocks to set, you can just focus on what’s important: Making great coffee. Internal Heater: Not only is the Bunn BT Velocity great for hot cups of coffee, but the internal heater keeps hot water available for other warm beverages or for cooking in general. With 800-watts, the heater has the water at a perfect temperature so that it’s always available for use. And since the coffee maker comes with a stainless steel carafe, you don’t have to drink burnt-tasting coffee or use a warming plate. And if you happen to go on vacation, you can set the vacation button so that the heater turns off during this period. What’s Not So Great About the BUNN BT Velocity Brew 10-Cup Thermal Carafe Home Coffee Brewer? Leaky: Even though the Bunn BT Velocity produces great tasting coffee, the carafe has a strong tendency to leak. Even Bunn is aware of the issue and has offered some helpful tips. There are gaskets on the pot and lid which need to be scrubbed thoroughly in order to remove the oils from the coffee. Using a bit of soap and warm water will do the trick, but this will have to be done often in order to prevent the leaking. Still, some current owners have continued to have the same issues with the carafe leaking, so it’s difficult to know whether you’ll have success or not. Size: Unlike other coffee makers that are streamlined in design, this Bunn is large. It needs a lot of clearance on the countertop and if it doesn’t, you’ll find that the top of the coffee maker will hit the cabinets. Fortunately, the machine doesn’t steam while brewing, so your cabinets won’t suffer this condensation. Not only is the coffee maker tall, but large in general, so be sure you have the space to give. Temperature: Although the water brews at the ideal 200 degree temperature, the temperature won’t last for very long. The stainless steel carafe does boast temperature-saving features, and naturally, stainless steel should lock in some temperature. But many current owners have said that the Bunn BT Velocity doesn’t keep the coffee warm for very long, so you may be drinking your coffee sooner than later. And since the coffee maker starts at four cups, many people find themselves making more than they need. Is the BUNN BT Velocity Brew 10-Cup Thermal Carafe Home Coffee Brewer a Great Purchase? The Bunn BT Velocity Brew 10-Cup is a great purchase, but there are a few issues to watch for. The carafe is prone to leaking and this can lead to some frustration. The coffee maker is also best in a home where there are several people drinking coffee, as the water indicator starts at four cups, and the machine is designed to brew ten cups of coffee in three minutes. 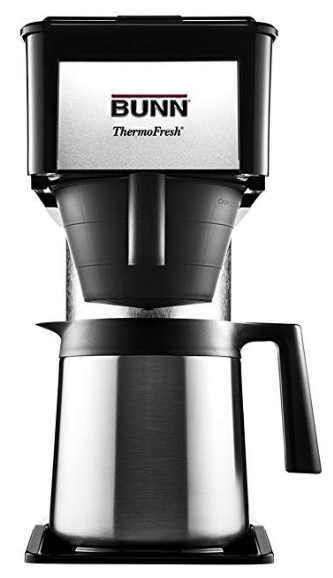 Overall, this is an excellent coffee maker that produces great tasting coffee in a short amount of time, plus has hot water waiting for other uses.